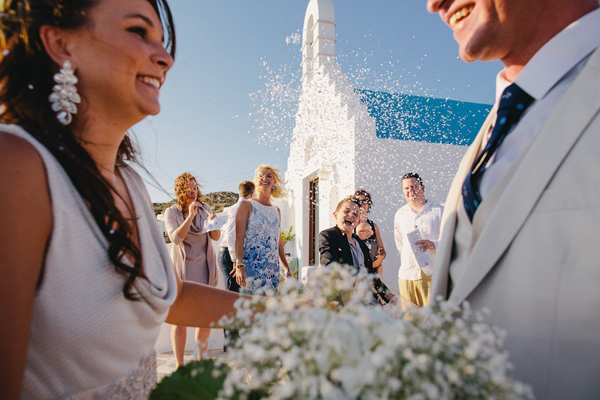 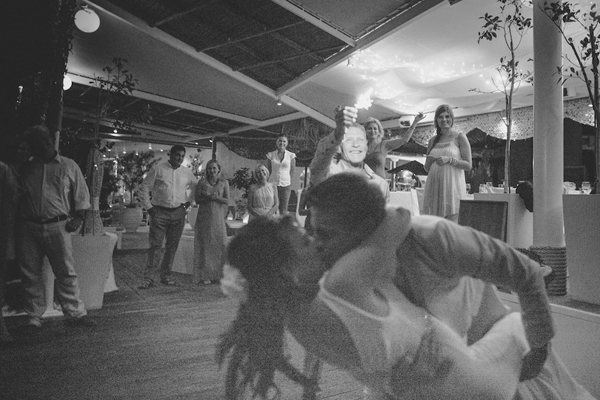 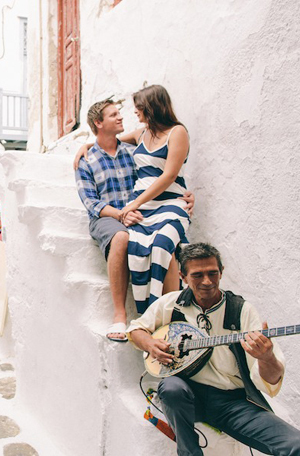 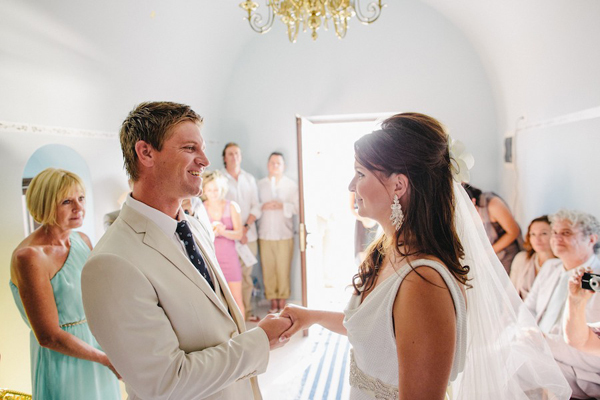 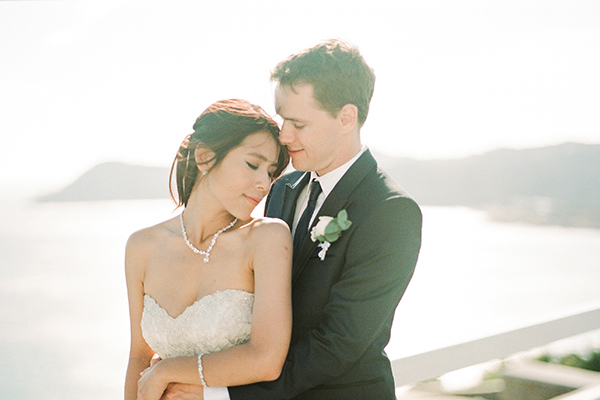 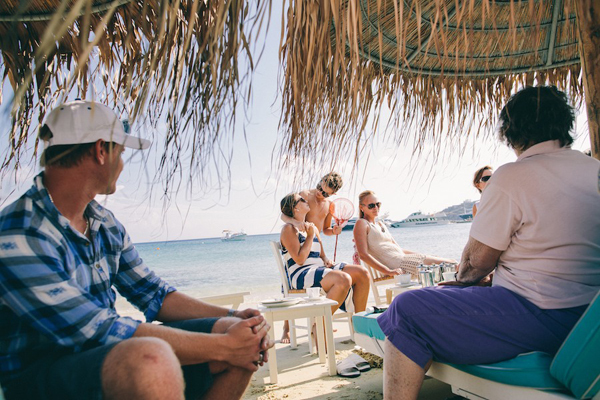 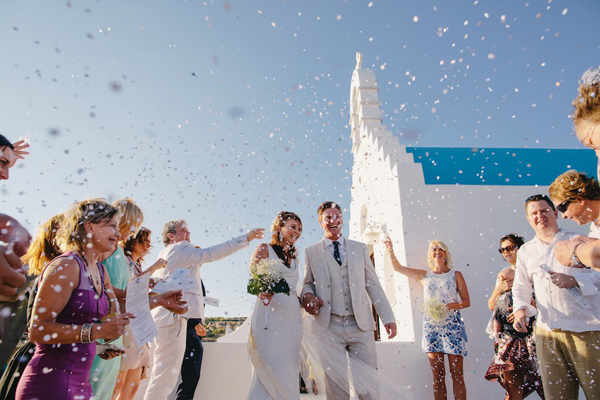 “Sandy and Wayne’s destination wedding in Mykonos was a dream come true for them. 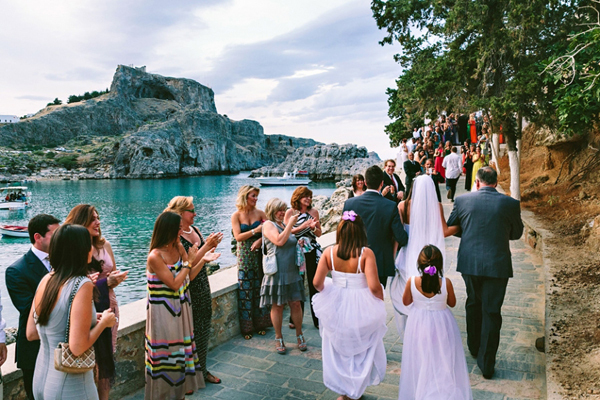 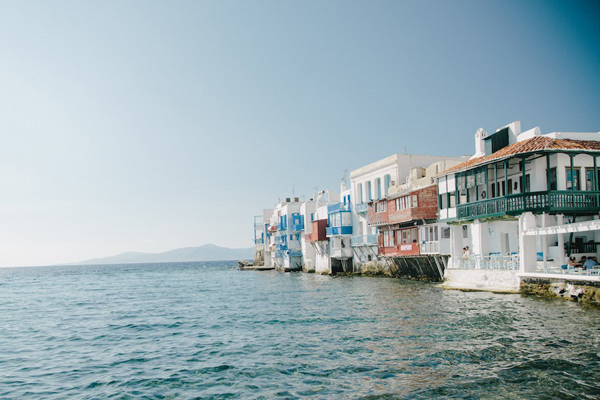 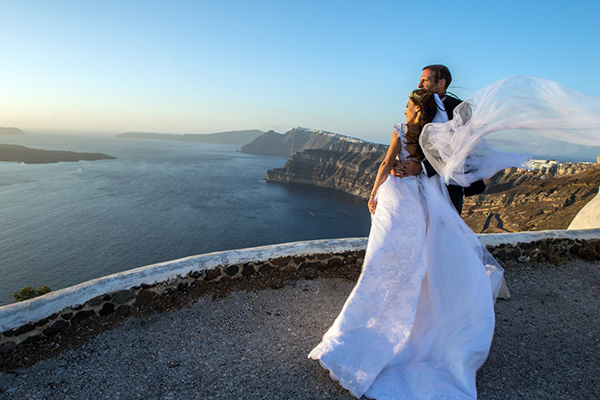 It all took place on one of the most beautiful Greek islands. 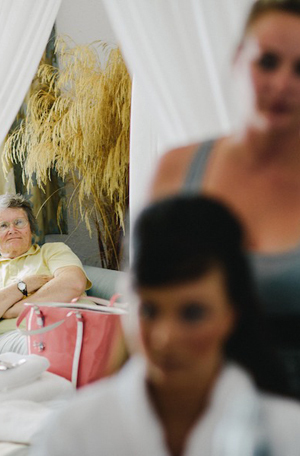 Sandy made her wedding bouquet with the help of her mother. 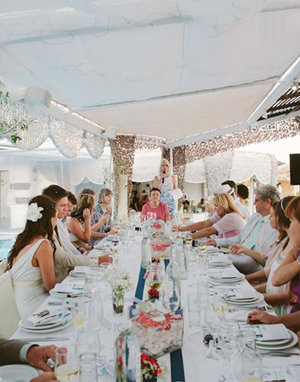 It was a delicate flower arrangement of the bride’s favorite flowers: baby breath and one exquisite hydrangea. 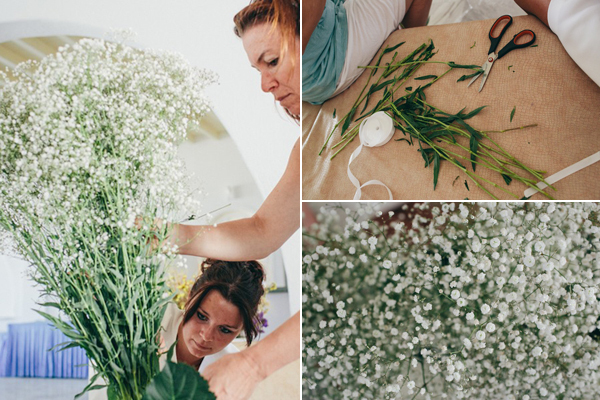 The entire floral wedding decoration was a DIY project of the women in her family. 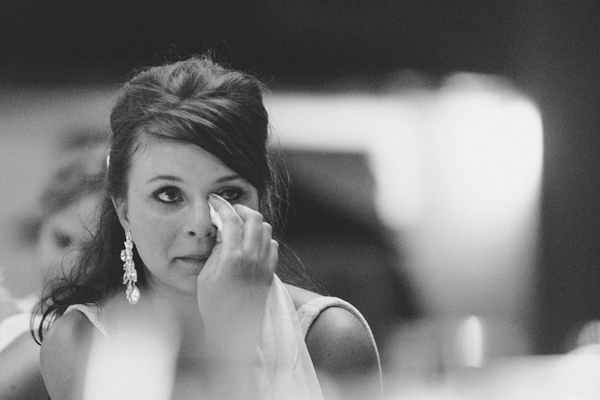 A true labor of love for the sweet bride. 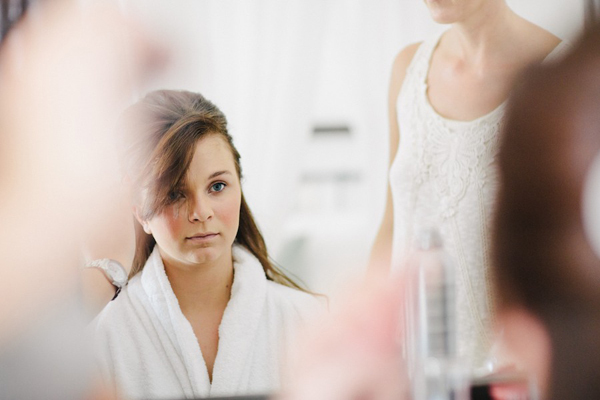 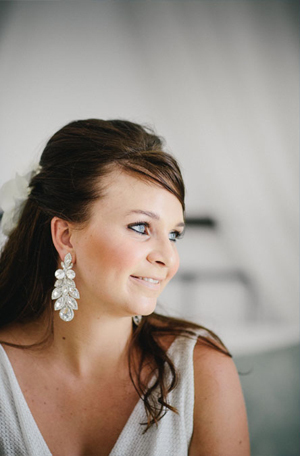 The bride’s hair was styled by mother, a hair stylist in Johannesburg. 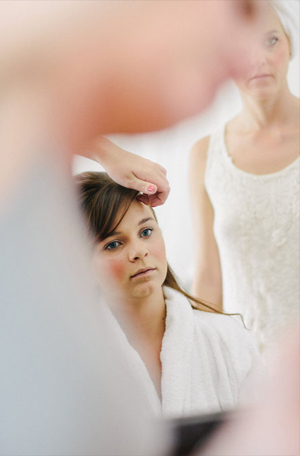 The bride did her own makeup, since she is a talented make-up artist herself. 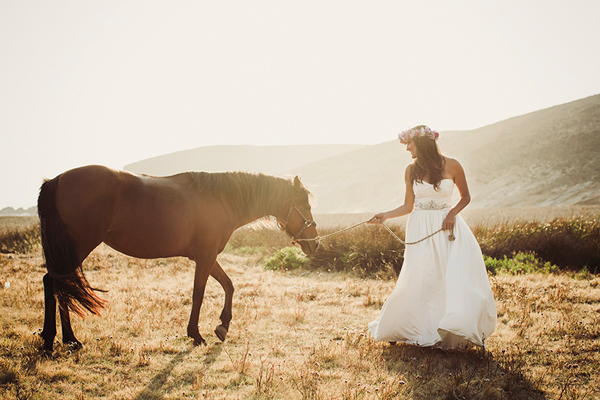 The light, airy and romantic wedding dress was designed by the Beverly Langley, a fashion designer and friend of the bride. 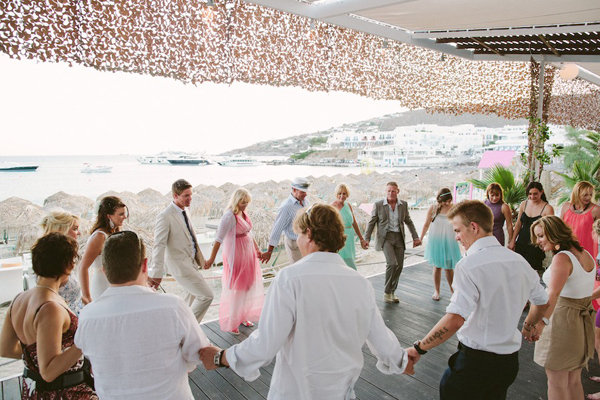 It was a very feminine dress… perfect for a wedding in Mykonos. 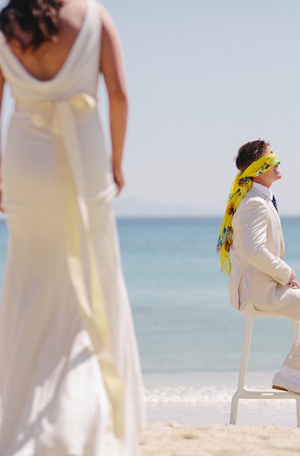 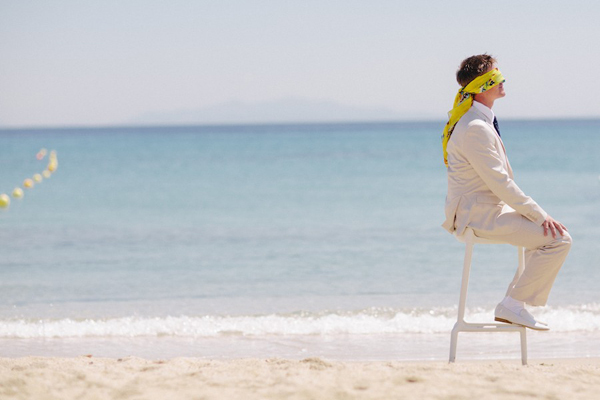 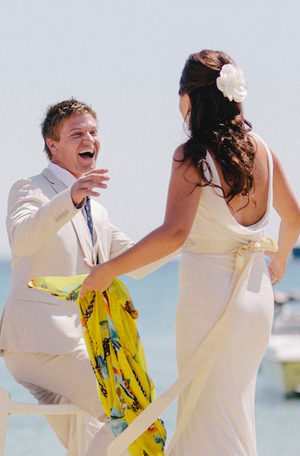 The groom did not wait at the church to see the bride for the first time…He was blindfolded on the beach and waited for his bride to present herself. 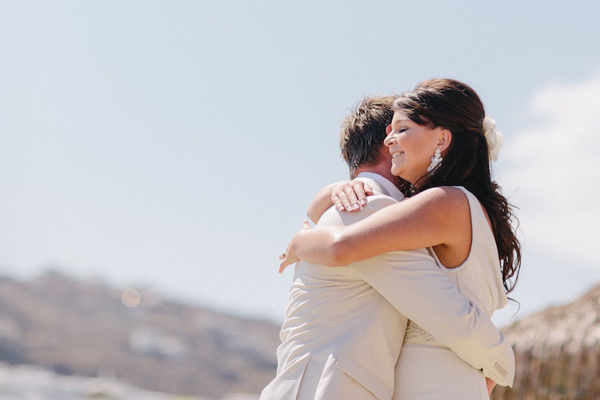 Sandy’s “surprise” was the best thing that happened to him on that unforgettable morning. 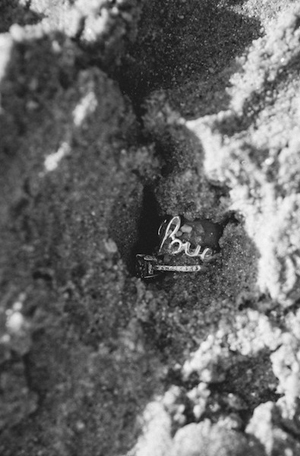 The wedding proposal had a little…adventure. 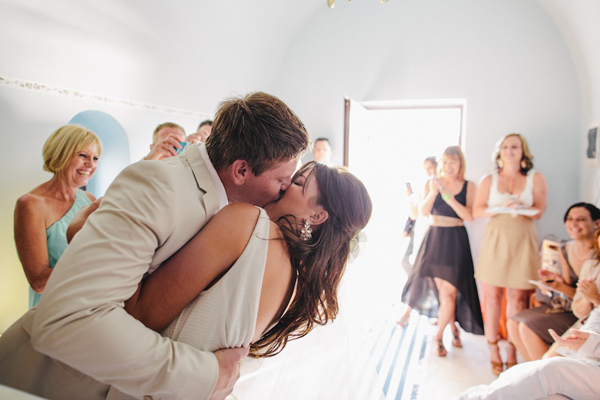 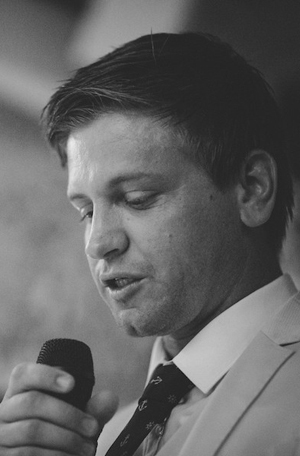 As the bride mentions: “Wayne planned a romantic weekend for the two of us in Durban, where he took me to the Moses Mabida Stadium to go bungee jumping, something I always wanted to do! 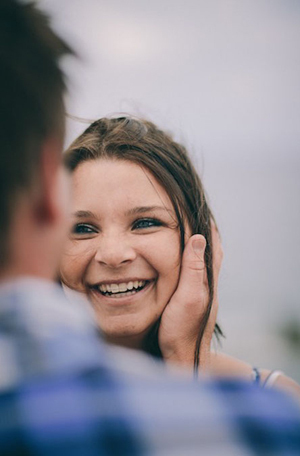 Our weekend ended in a romantic way: We drove down to the south coast where we went on our first holiday together. 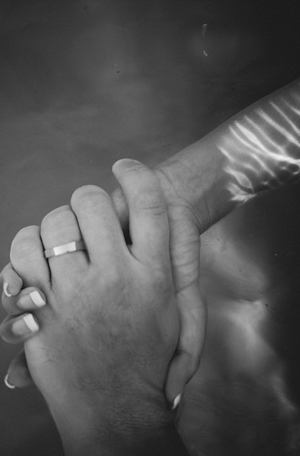 There he had a picnic laid out with champagne and treats… As the sun was setting; he gulped down the entire glass of champagne, got down on one knee and asked me to spend the rest of my life with him”. 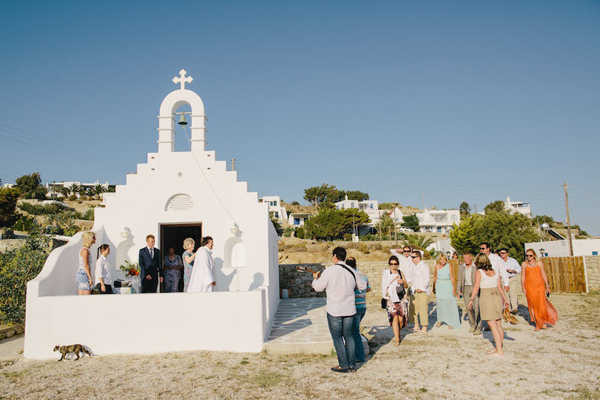 The wedding guests arrived at the Church of Agios Konstantinos and Eleni, with tradiotional greek island music. 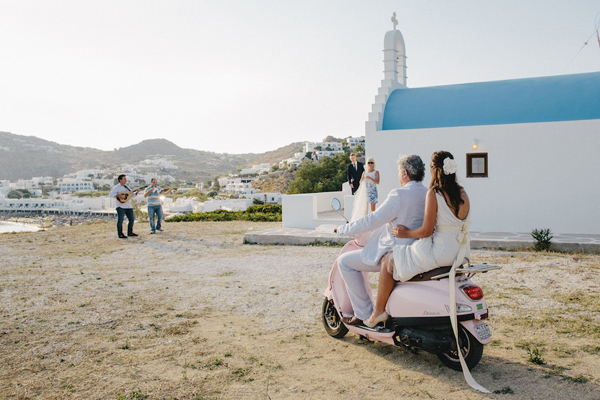 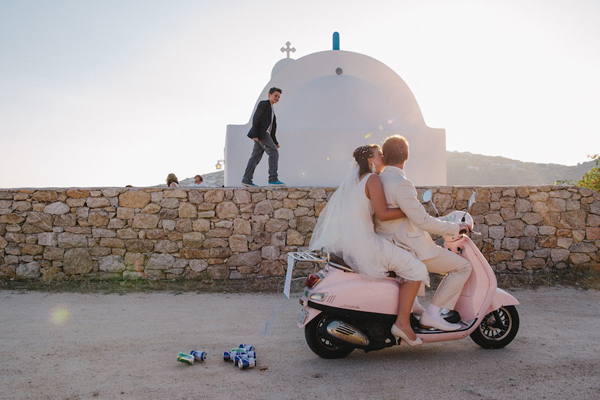 While the groom was waiting for the bride at the altar, she made an appearance in style: on a pink trendy scooter! 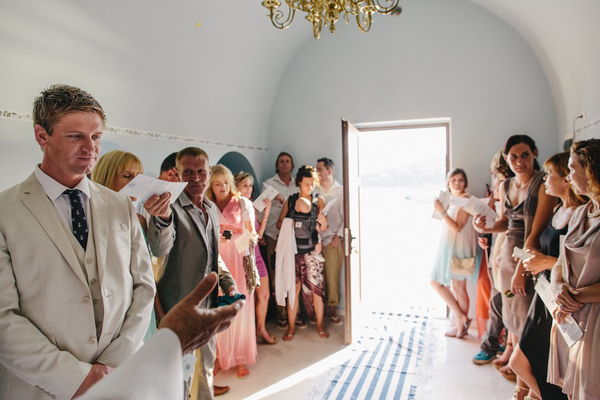 The most beautiful moment for the bride was: “when I was heading towards the church that was on a hill, the sun was setting…I arrived, entered the church and saw my husband waiting for me…it was an amazing moment”. 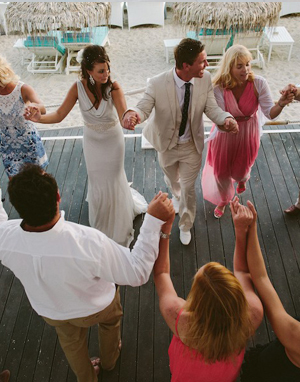 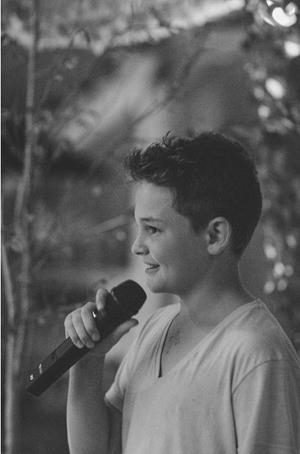 A beautiful and heartfelt ceremony followed. 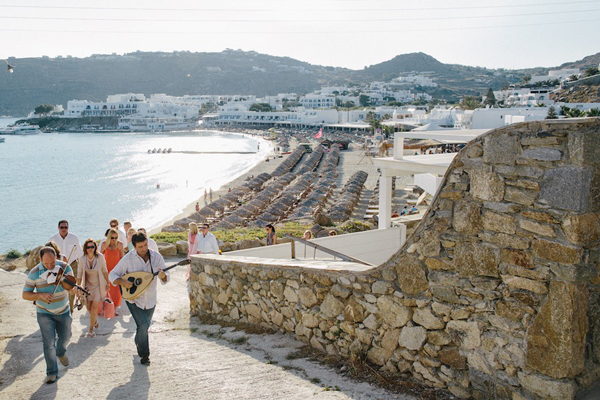 The wedding reception was held at Mykonos Palace Hotel. 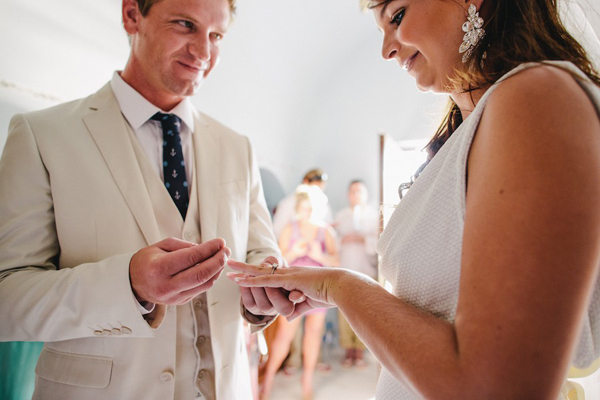 The groom’s sweet and kind words along with the wishes expressed by her family members, brought tears to the bride’s beautiful eyes. 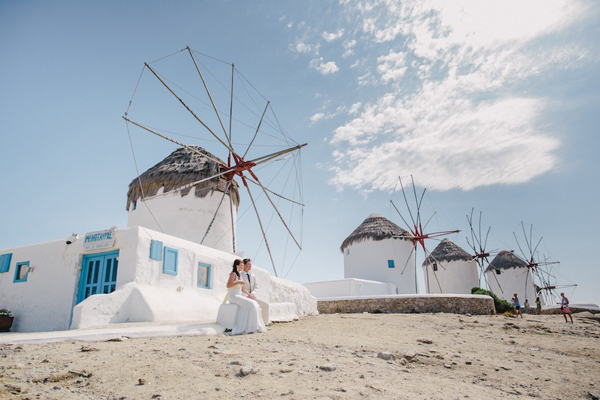 A phrase from the brides’ favorite book “Wuthering Heights”, says a lot about this very touching destination wedding in Mykonos: «Whatever our souls are made of, his and mine are the same».